There are two separate related animations here. The one loaded first is rotation about Φ When you "Start Animation" it will appear as if the molecule is rotating about the Φ angle. The red dot on the Ramachandran plot indicates the current value of the angle. You may change to see the rotation about Ψ by pushing the "Load Psi Animation" button. You must then "Start Animation" again. With atoms represented as spheres you can see where conflicts between them arise. You may turn the "Spacefill Off" to see the rotation better. You may highlight the various atoms to see which are involved more clearly as well. If you want to see an individual frame of the animation, you may click on a green dot in the Ramachandran plot. The angle will be highlighted and measured if you turn off the spacefilling. In each amino acid of a peptide there are only two bonds in the mainchain that can rotate. The are called Φ and Ψ. To determine the rotation about a bond, FOUR atoms are required: the two that make the bond, and the two atoms bonded to either side of this bond. This is called a Dihedral angle. To see how this works, look along the length of the rotatable bond so that it is perpendicular to the screen. The atoms on either end then will describe an angle that can be measured. 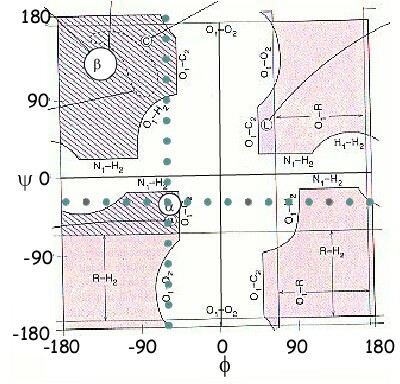 The picture shown in the upper left corner is a "Ramachandran" plot with the dihedral angle Φ on the horizontal axis and the other dihedral angle Ψ on the vertical axis. Most amino acids can only occupy the area colored in PURPLE, Glycine has more flexibility than the other amino acids and can occupy all the PINK. Some angle combinations are not allowed at all because as the bonds theoretically rotate though all possible angles(-180 degree to +180°) sometimes atoms on either side of it come into contact and thus are prevented from taking these positions in reality. These places are represented in WHITE on the plot. The difference between glycine and all the other amino acids is whether two Hydrogen or one Hydrogen and one Carbon is attached to the Cα. I do not want you to memorize this. I simply want you to get a sense of how important it is that atoms take up space and cannot occupy the same space at the same time. This goes to show the importance of those "Steric Interactions".